An impressive feat of architecture, carved into the bedrock. 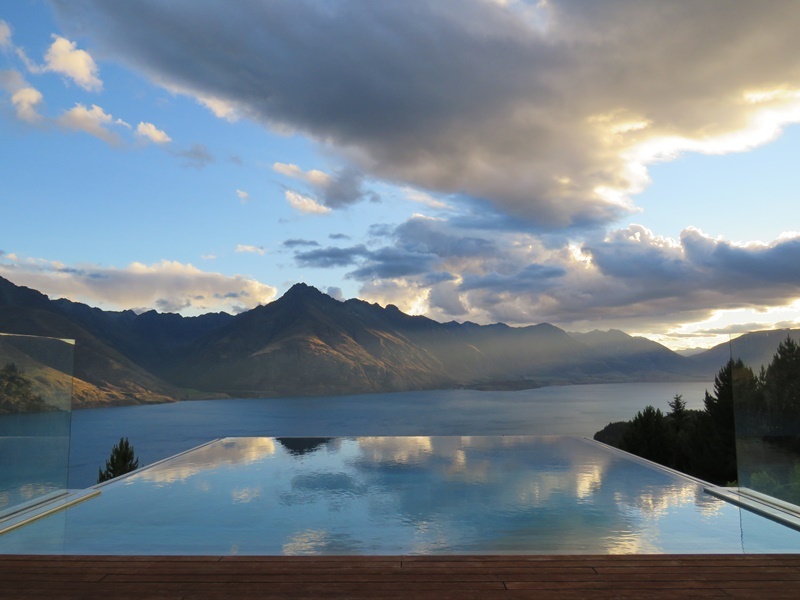 Hanging from a cliff on a mountainside 10 minutes from Queenstown is the jewel-like Jagged Edge, a rare undiscovered gem in the ultra-luxury private villa accommodation market in New Zealand. 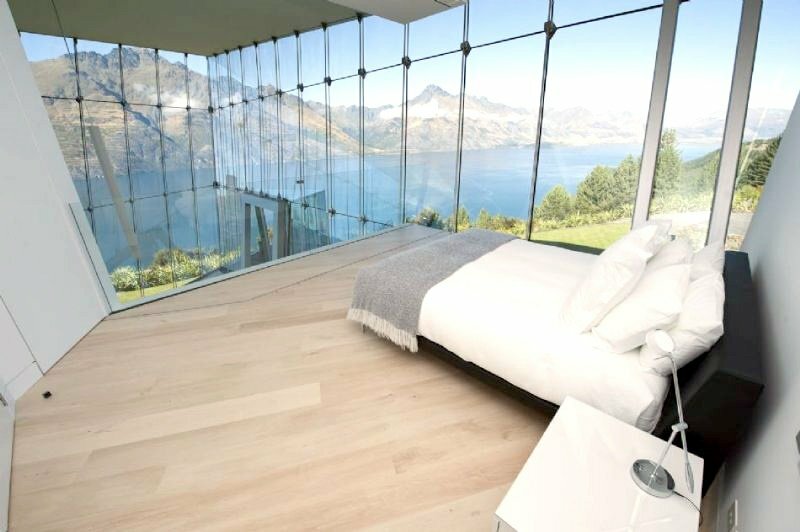 In a region with a plethora of luxury lodges and hotel suites, Jagged Edge literally stands alone. 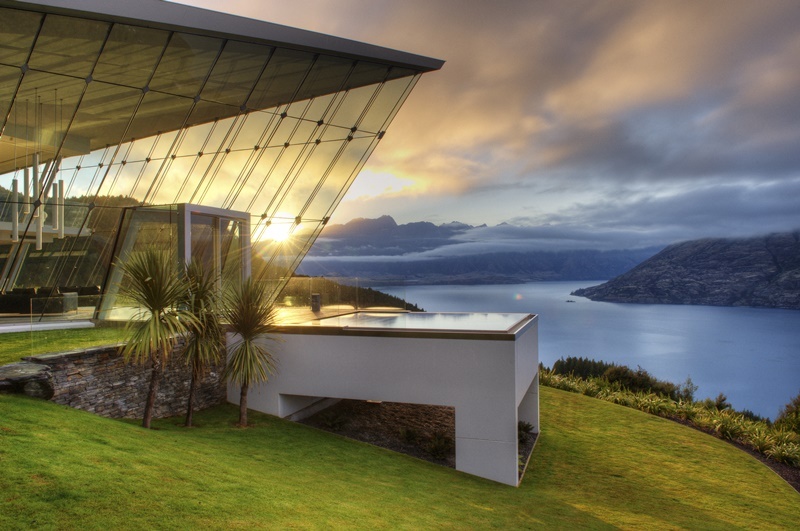 A holiday home belonging to a New Zealand family, the property is unique and unrivalled in design, location and privacy. 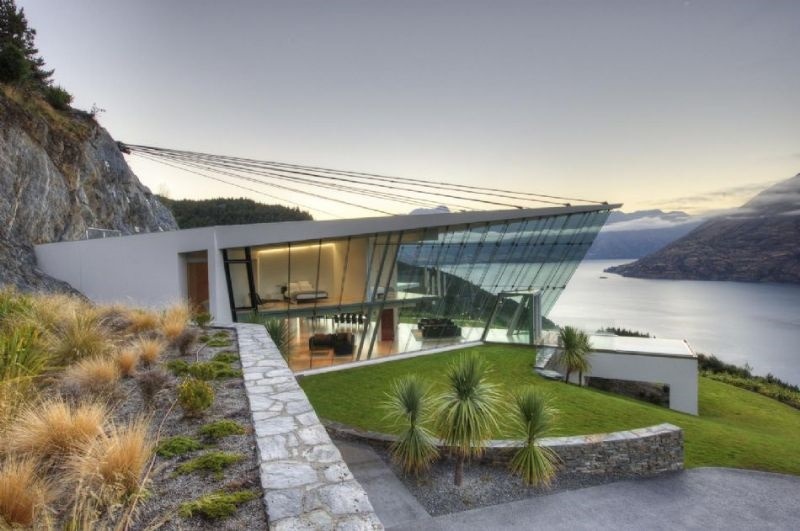 Anchored to the rock with steel cables drilled deep into the mountain, the bold, dart-shaped glass and steel prism appears to catapult from the rock face as if heading for the sky. From a distance, the roof looks as if it is held up by the talons of a giant peregrine. The visual impact is startling. 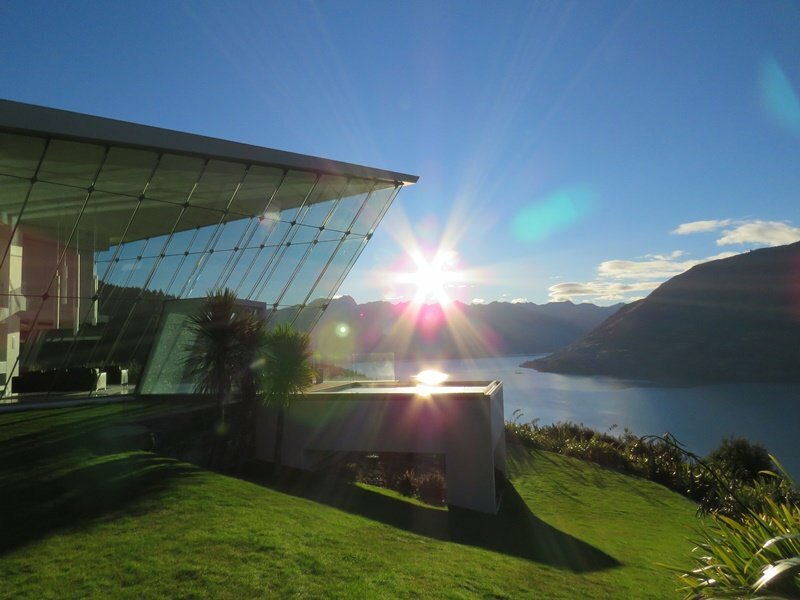 At the height of summer, the structure shimmers, like the prow of a glass ship floating between the bleached blue Central Otago sky and turquoise-jade of Lake Wakatipu. 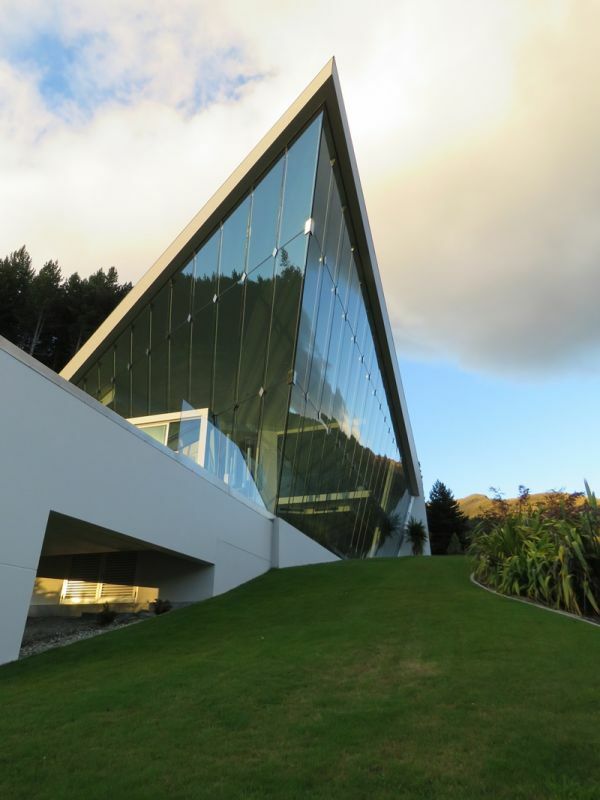 One of the owners and designers of Jagged Edge, a Wellington-based mechanical engineer, said 8,000 cubic metres of rock were excavated to form the platform for the house. 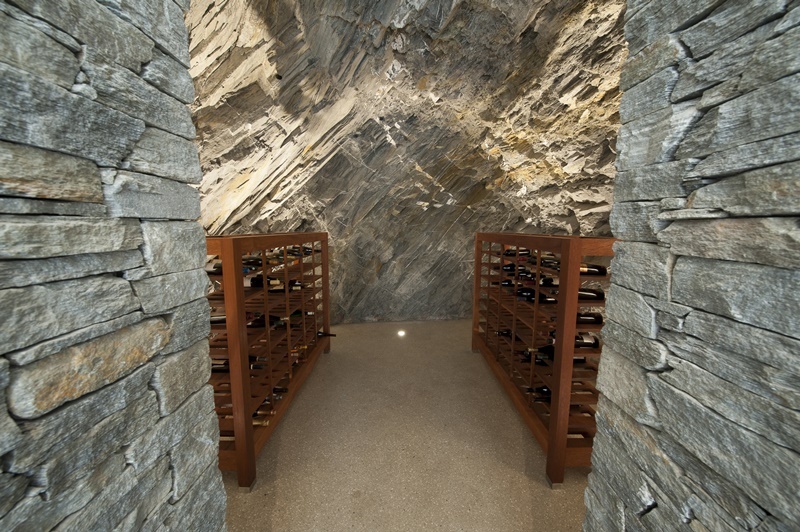 A wine cave and two-car garage are chiselled even further into the bedrock. 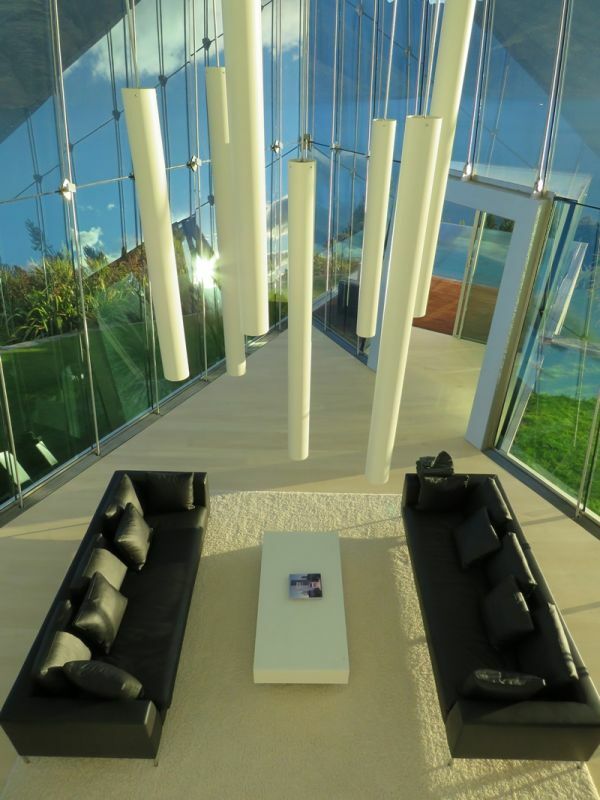 Floor-to-ceiling steel rods and bolts support massive glass walls that jut out from the base at an 18-degree angle, soaring to 9.2-metre at the apex of the triangle. 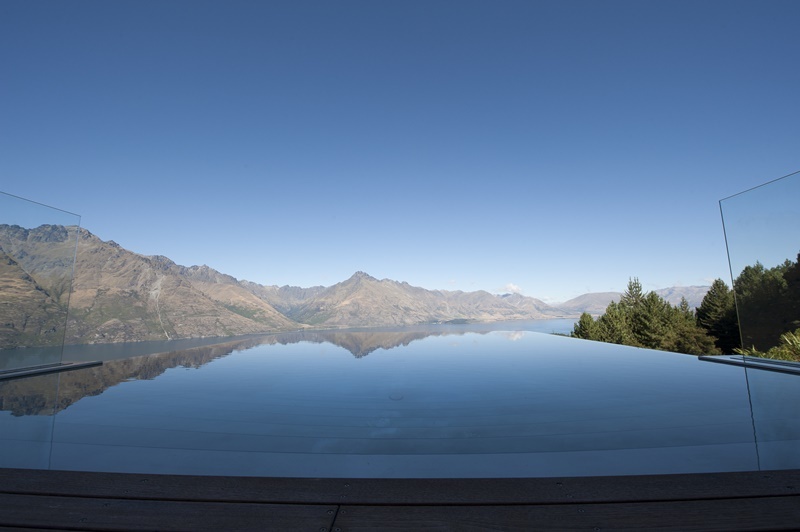 A 5m by 6m infinity spa pool sits to one side of the prow. 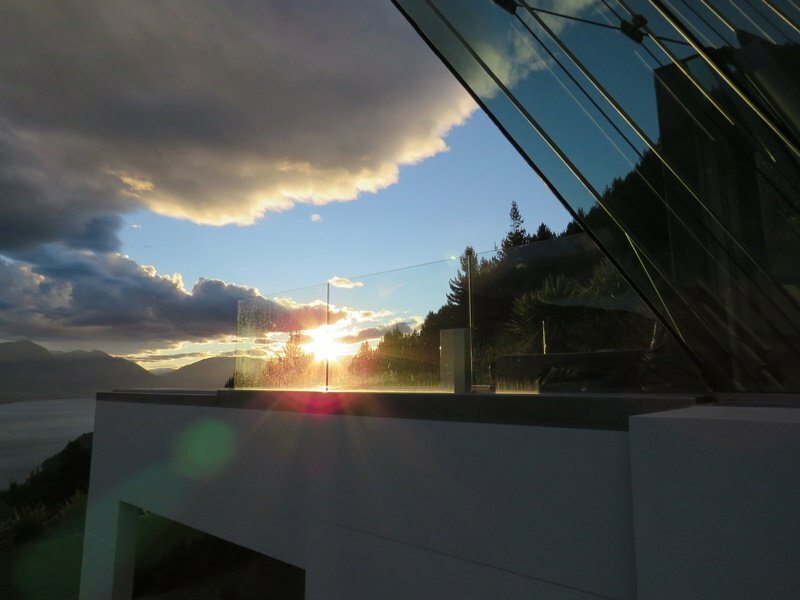 The structure is so light on the landscape, it’s nearly invisible – you can see through it to the mountains and lake on the other side. 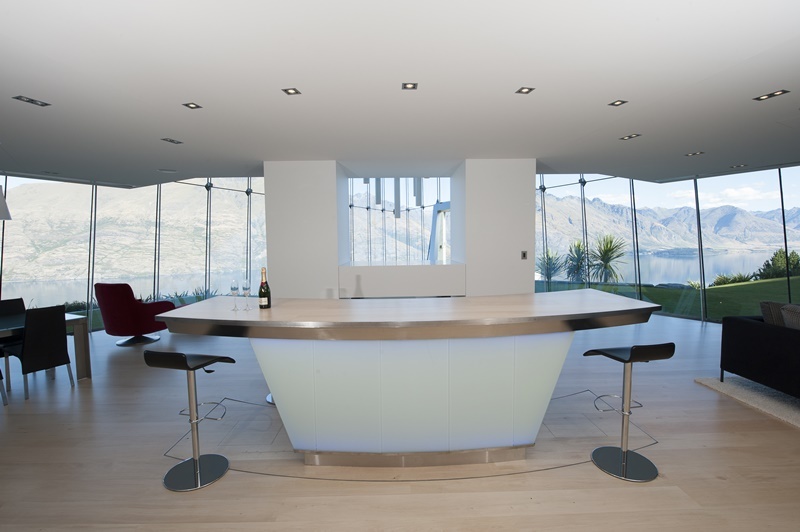 The interior design of the three-bedroom, four-bathroom house is almost entirely open plan and the décor is deliberately understated – free from any impediment to the 270-degree panorama of Queenstown’s trademark glacier-gouged Remarkables and Cecil and Walter Peaks, rising perpendicularly from Lake Wakatipu. 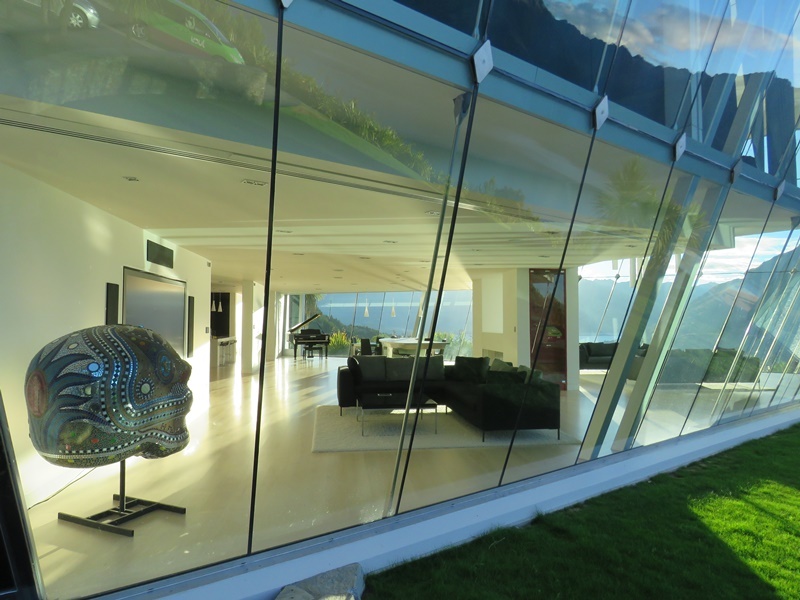 Man-made adornments are superfluous when landscape masterpieces fill one’s entire field of vision through the glass walls surrounding the kitchen, living, dining and entertainment areas downstairs, and the sumptuous bedrooms and bathrooms on a mezzanine platform upstairs. 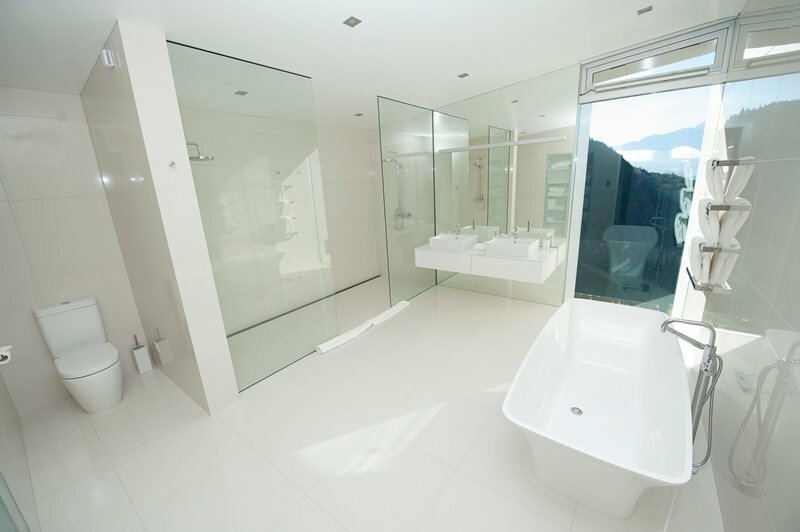 Even the freestanding bath in the white porcelain-tiled master bathroom and the double shower that runs the full length of the bathroom have mountain and lake views. 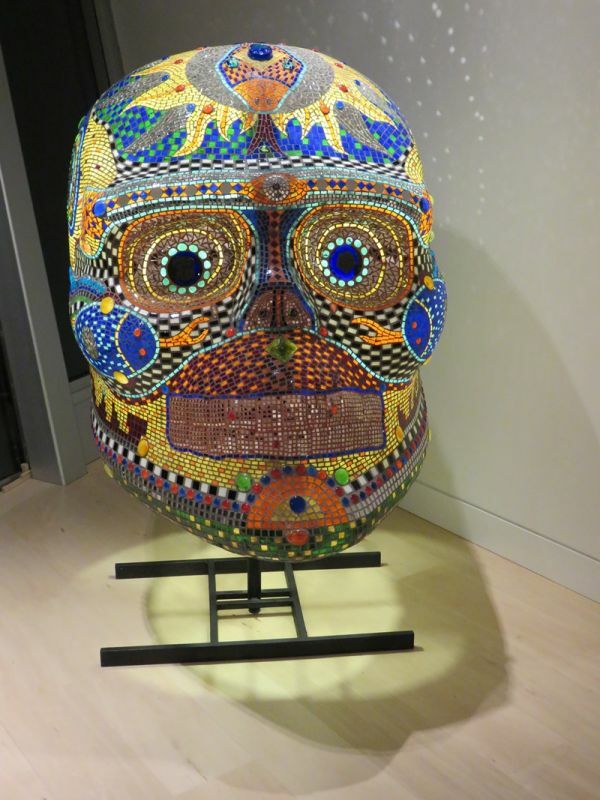 Among the few embellishments in a house where the landscape takes centre stage are two dramatic lighting features – an eye-catching mosaic head from Mexico and an imposing glass sculpture of a kiwi in the stairwell designed by New Zealand artist Peter Stoneham. 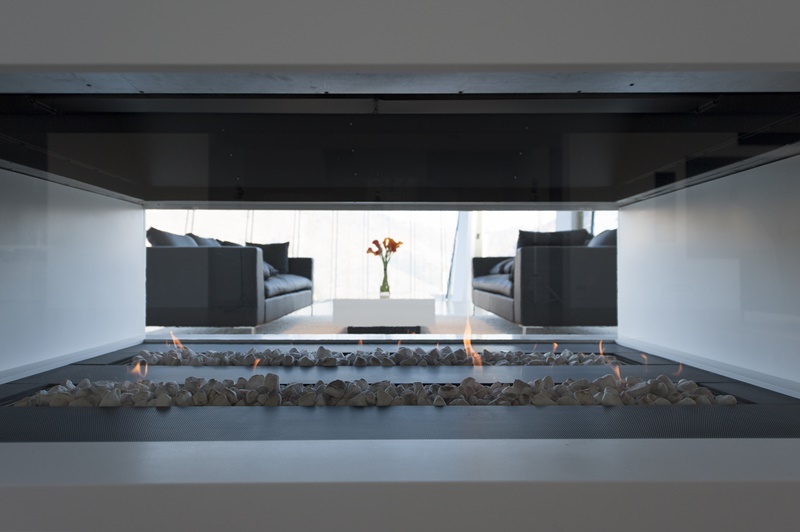 With its pale, timber flooring, glass walls and clean lines, the overall effect is one of understated elegance. 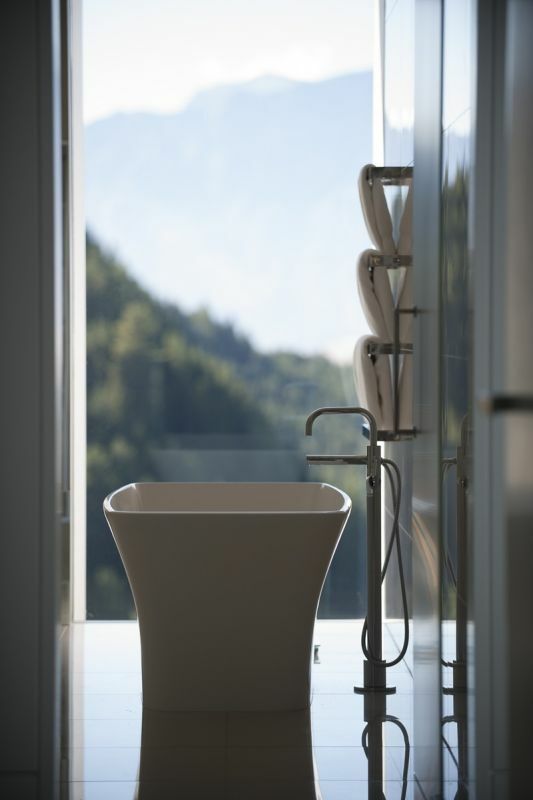 It’s an extraordinarily luxurious, restful place, devoid of fussy detail and decoration. 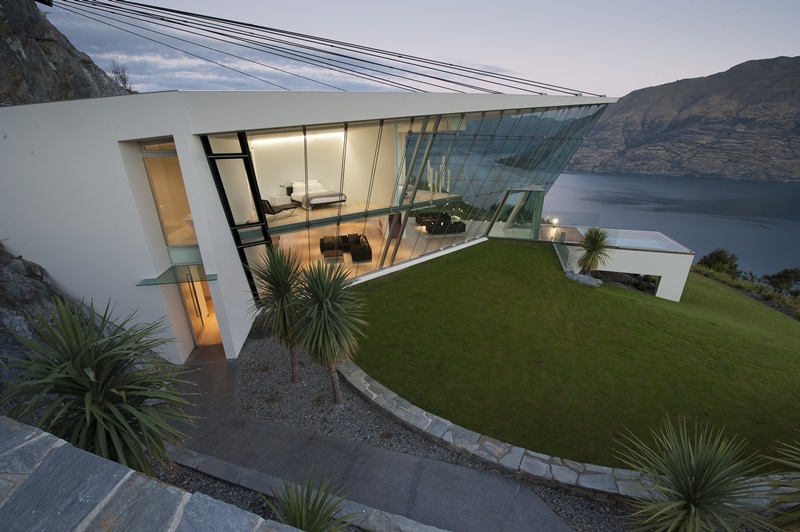 Jagged Edge is awash with smart technology: the sickle-shaped 3.7m bar that rises from the floor; wall-panels that float across the mezzanine floor to enclose the open-plan bedrooms; the grand piano that can be programmed to play itself; the spa pool that automatically lowers the water level to allow a recessed cover to slide across the surface; the subterranean wine cave tunnelled into the schist. When not ensconced in the 38-degree water of the spa pool, guests can use the impressive facilities at the nearby equally-palatial five-bedroom, six-bathroom guest house. 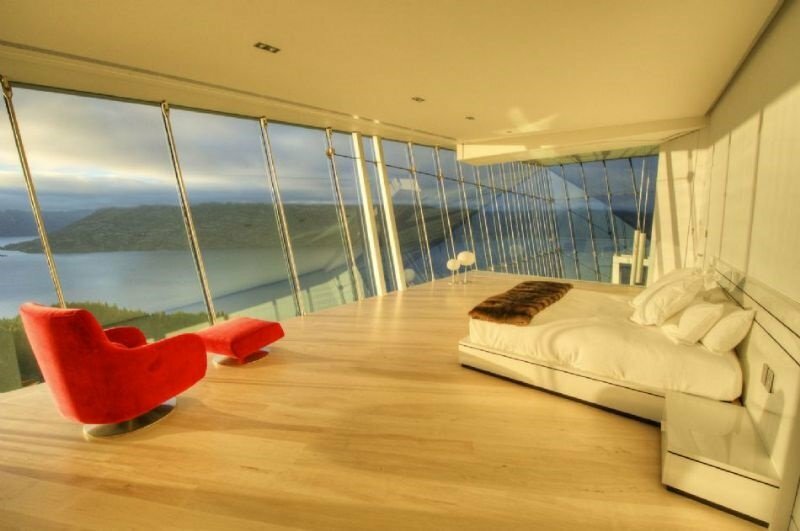 The house, which can be rented separately or in conjunction with Jagged Edge, has a heated swimming pool, spa pool, sauna, gymnasium, kitchen, an expansive living area with wrap-around deckings and the same awe-inspiring views. 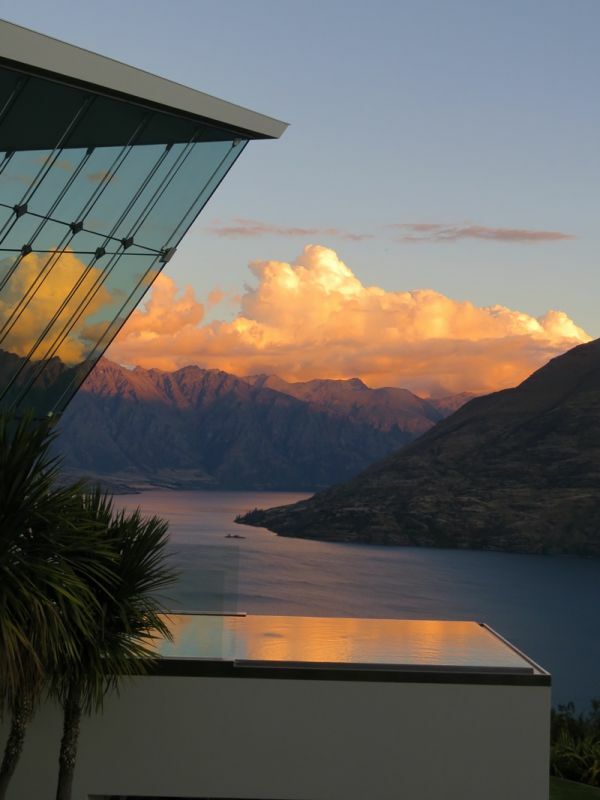 Guests can tap into Luxe Houses’ concierge services and their trusted network of professionals who specialise in ensuring every stay is flawless – charter jets, helicopter transfers, yachts, launches, jet-boats, drivers, bespoke spa treatments, personal trainers, experienced nannies, hiking guides and ski instructors. 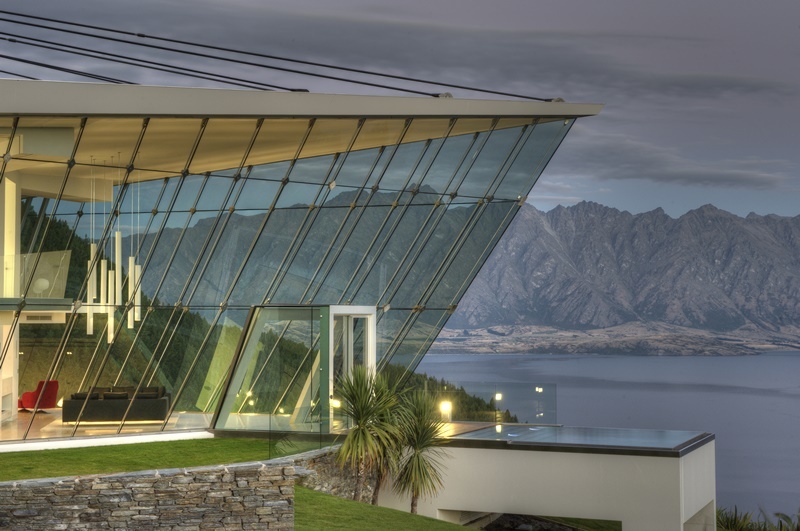 Luxe Houses can also arrange celebrity chefs, waiters and butlers for those who would rather dine at home than eat out at Queenstown’s world-class restaurants. 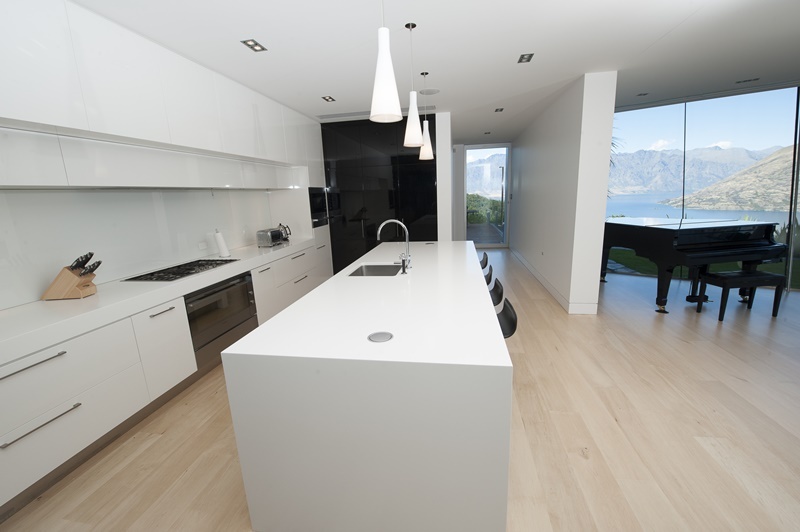 The state-of-the-art kitchen with its four-metre island bench is designed with entertaining in mind. 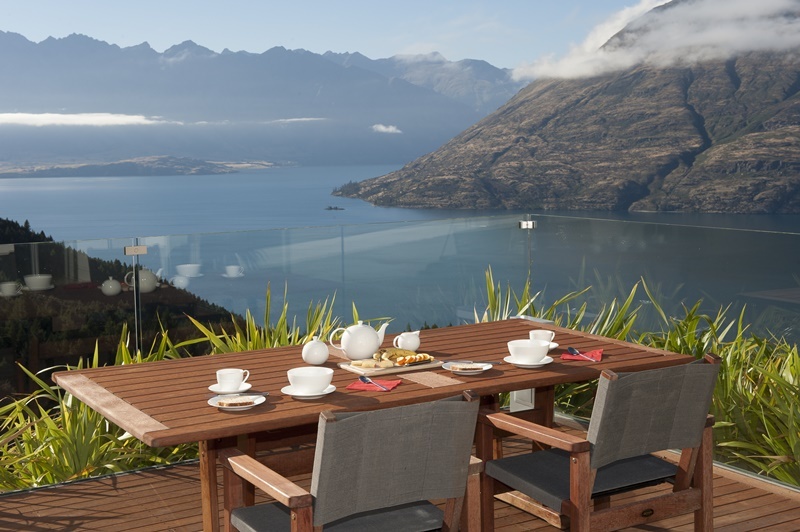 Queenstown – New Zealand’s premier all-seasons tourist resort and “the adventure capital of the world” – is on your doorstep. 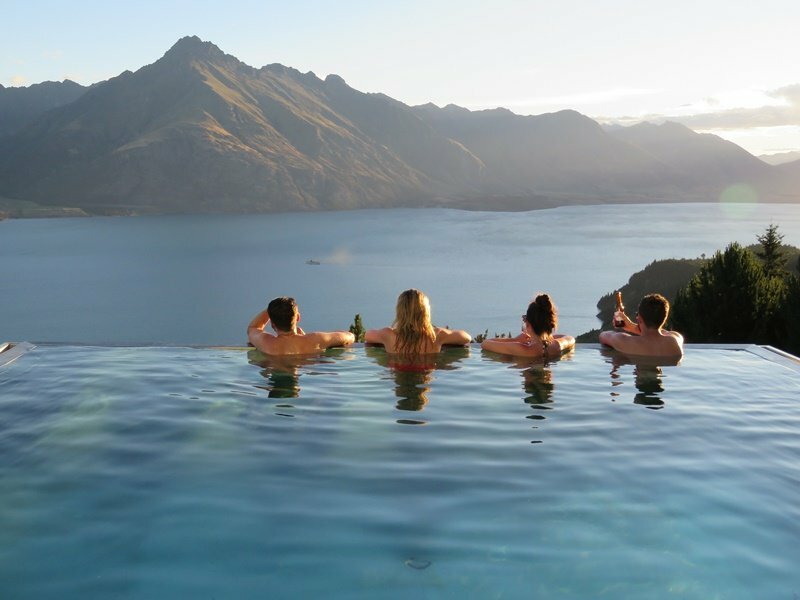 Your concierge can arrange an adrenaline-pumping trip in the famous Shotover River Jet or a jet-boat expedition up the Dart River, deep into Mt Aspiring National Park, combined with a dreamy drift downstream in inflatable kayaks called “funyaks” amid scenery made famous by Sir Peter Jackson in The Lord of the Rings trilogy. 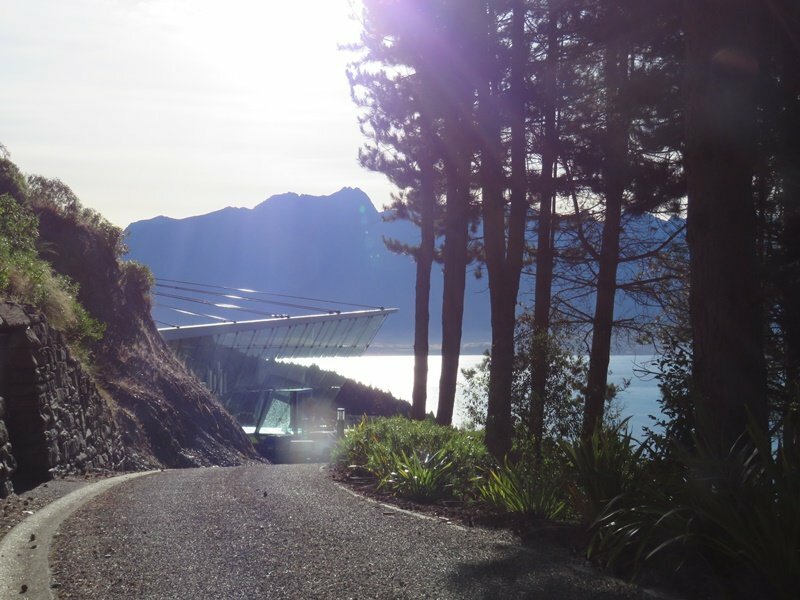 Revolution Tours will take you on an unforgettable experience starting with a cruise across Lake Wakatipu to Walter Peak Station on the “Lady of the Lake”, the historic steamer TSS Earnslaw, cycling along the lake edge to Mt Nicholas Station or up the pristine Rees and Dart Rivers to a place aptly named Paradise where you are encircled by mountains named after Greek gods. A cruisy ride made even easier by electric bikes (by arrangement). 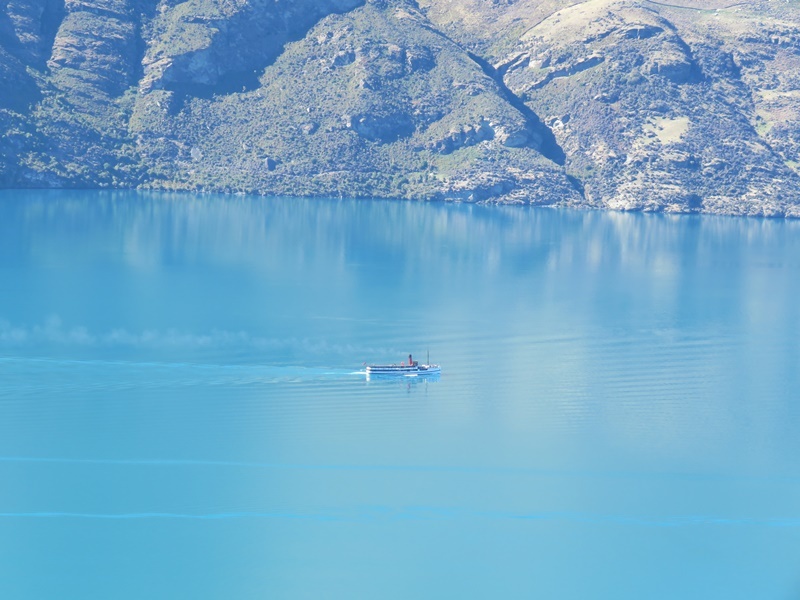 Return to Queenstown by boat, helicopter or road along the shores of Lake Wakatipu, rated one of the world’s top 10 scenic drives by Condé Nast and Lonely Planet. 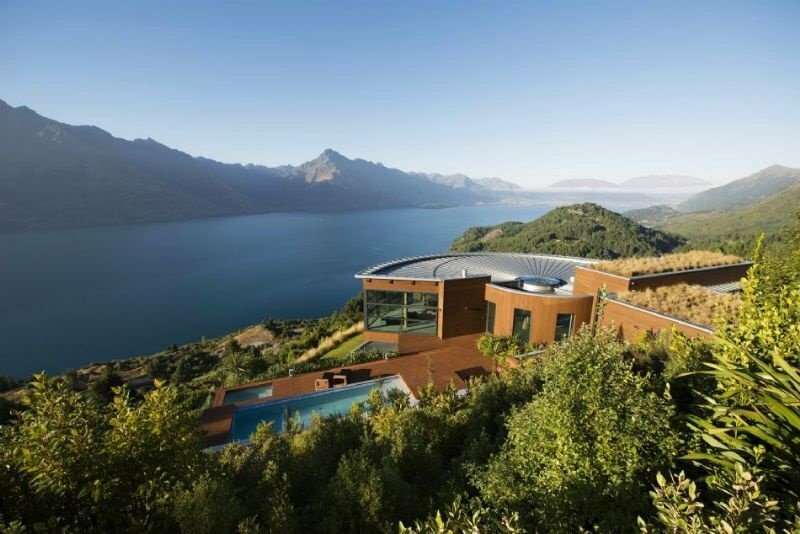 The Luxe Houses’ New Zealand flagship properties were launched in March 2016. They won’t stay a secret for long. 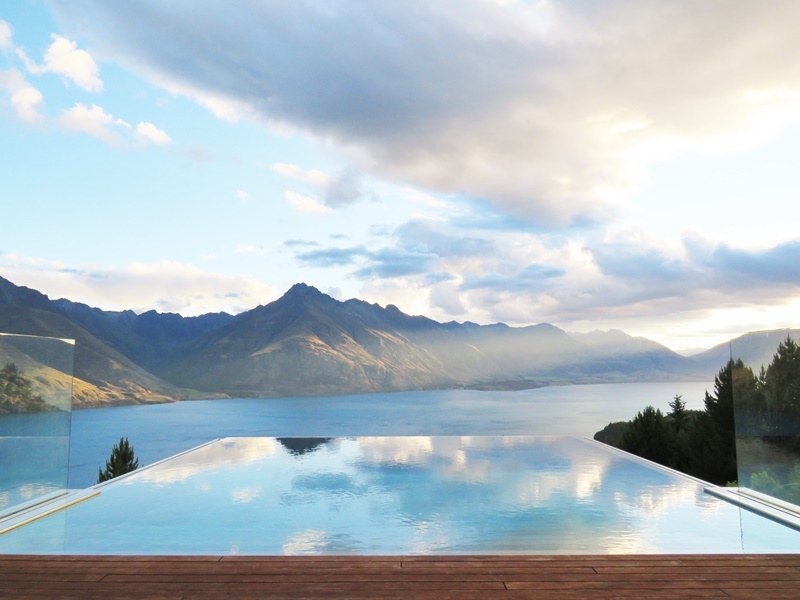 •The property, located at the end of a private road beyond two coded security gates, is 20 minutes’ drive or five minutes’ heli-transfer from Queenstown International Airport.